Near its beginning, the Liber Vitae has a large picture of the saved and damned spreading over two pages This page, at the top, shows St Peter welcoming the queue of saved from the facing page while Christ is adored within the Heavenly Jerusalem. 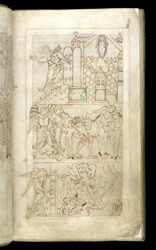 In the centre band, souls are fought over, with St Peter winning by force of the Book of Life (over the devil's faulty document) backed up with his large key, and a lay man and woman shudder comforted by an angel (who has consulted the Liber Vitae) as two companions dive into damnation. In the lowest, an angel prepares to lock the gates as a monstrous devil grasps sinners by the hair to fling them into the maw of Hell.